A school meal provides 1/3 of the child's daily requirement of nutrients and we offer a wide range of healthy options in our nutritionally, analysed meals. In 2006, the government introduced new standards for school lunches. Some foods were banned i.e. fruit squash, chocolate, some foods were restricted i.e. fried foods and some were specified to be on the menu daily i.e. bread, fruit & vegetables & oily fish every 3 weeks. Fruit and water must also be available to all children. 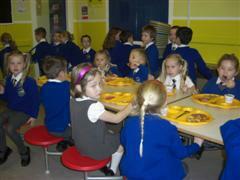 From September 2008 meals must meet national standards for iron, zinc, calcium and carbohydrates. What are the benefits of a school meal? 3 main course choice and a choice of 4 desserts. The children sit down together and enjoy their meal at the same time developing social skills i.e eating together, choosing food, collecting cutlery etc. A well fed and happy child is more likely to participate in afternoon activities. To provide quality nutritional healthy meals, in a safe hygienic environment. Quality - recipes high in fibre, low in fat, sugar and no salt. - no harmful colours, flavourings, additive or nuts used. Dietary needs -vegetarian, multi cultural, gluten free, nut/egg allergy or any other. Standards 4 * scores on the hygiene rating. All kitchen staff trained to food hygiene regulations. All equipment complies with health and safety regulations.